A customer Service Support interacts with the customer’s of the company and gives them the required information pertaining to queries or inquiries of the company’s product or service. 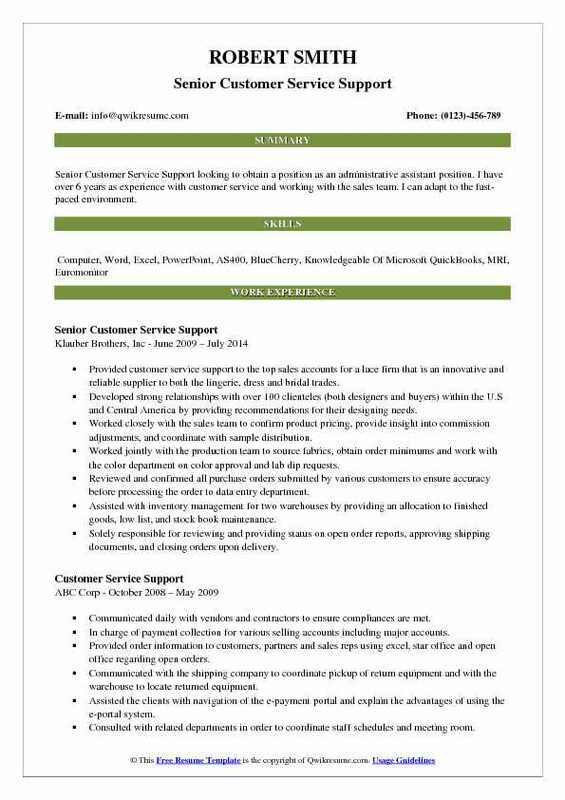 The Customer Service Support Resume describes few other job tasks such as handling customer problems and resolving complaints, assisting in sales, assisting in clerical tasks, offering advice or instructions, maximizing customer satisfaction and disbursing all other service tasks. 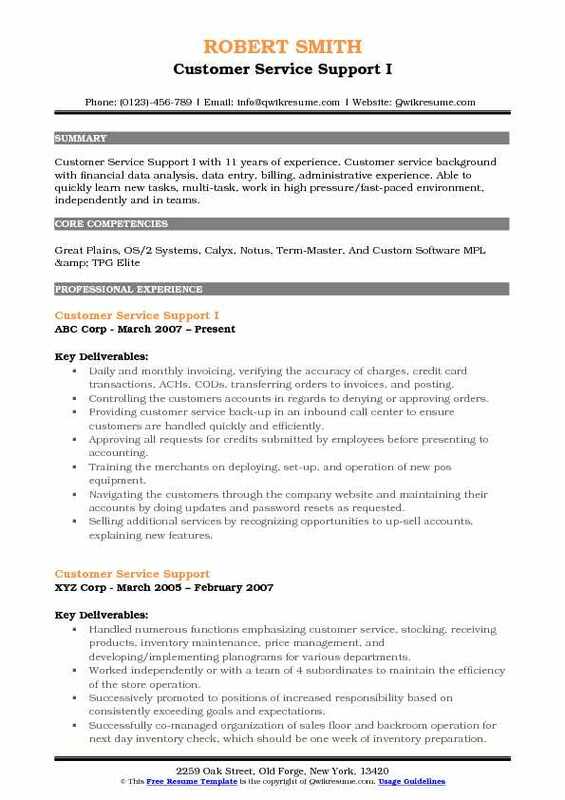 The best Customer Service Support resume focuses on core skill sets such as the ability to handle disgruntled customers, communicative abilities, the ability to process high volumes of work within the time frame, good problem-solving skills and hands-on experience in data entry operations. Even though a high school diploma is sufficient to apply for this job post, it is preferable to hold a Bachelor’s degree in marketing or communication or its related field to begin a career as a Customer Service Support. 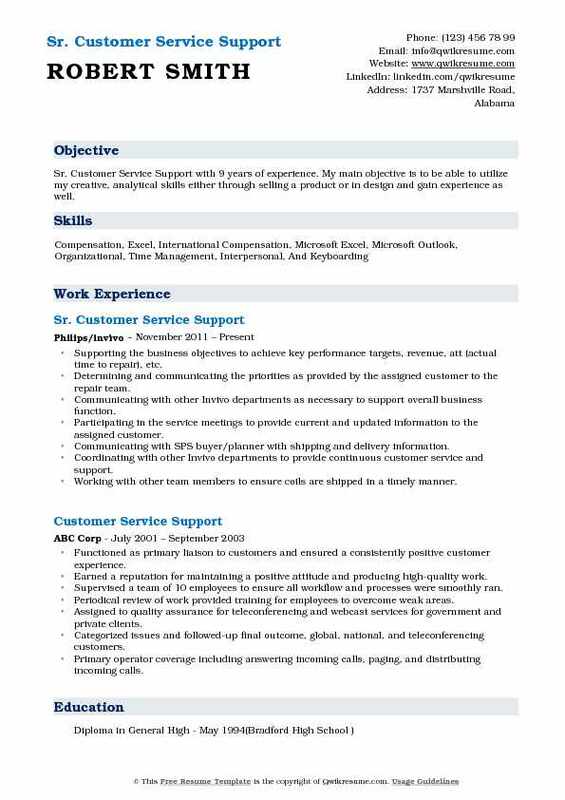 Summary : Customer Service Support 3 with over 11 years of experience in Customer Service and IT Systems Support. Self-directed, confident professional with effective troubleshooting, customer relations, interpersonal, and leadership skills. Technical knowledge in network management tasks, including user and security administration, file/directory access, and remote access service, experience with TCP/IP and NetBIOS protocols. The first point of contact for customers focused on delivering world-class customer service. Responding to customers quickly and efficiently to ensure they receive the correct level of service based on their entitlement. Triaged calls by directing customers to the correct technical or clinical resource who can assist them in getting their issues resolved as quickly as possible. Preparing the engineers for the installation of hospital equipment and dispatched field service engineers for facility support. Providing a high level of customer service via telephone to internal and external customers and takes a proactive role in personally owning the customer support experience. Seeking to improve customer satisfaction, providing clarification of customer requests and/ or problems. Providing an initial response for tier 2 technical support, parts ID, and clinical support teams. Performing self-monitoring of individual calls to ensure customer needs are met uses knowledge, tools, and applications to provide customer solutions. 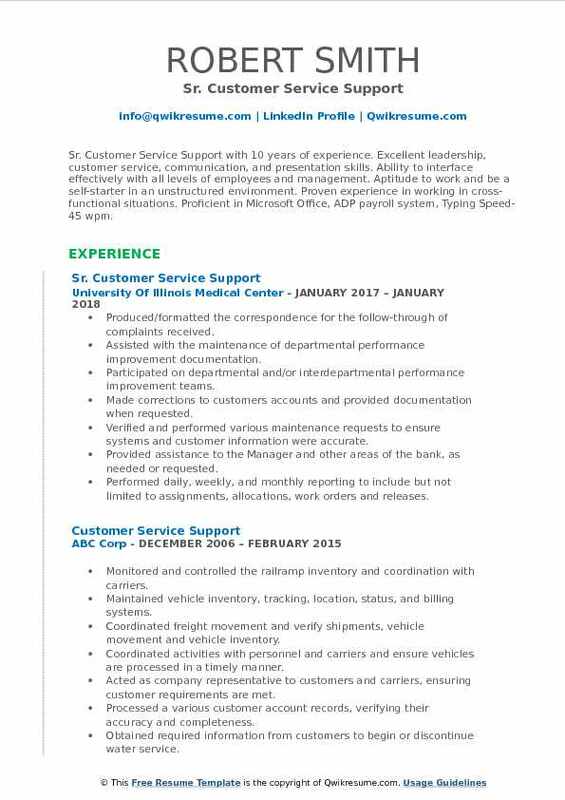 Summary : Customer Service Support II with 18 years of experience wants to obtain a significant and challenging position as a customer service support wherein I will learn and excel in customer services. Provided leadership and technical support to customer service coordinators and customer service tech. Handled customer orders and resolved clients concerns while promoting good public relations. Maintained and delivered optimum quality of service to customers to maximize productivity. Assisted in the coordination of activities with other internal departments to meet customer needs. Processed and maintained customer orders in both Microsoft access and vai system to assure service ratings are accurate and in-line with defined performance levels. Responded to routine inquiries related to office functions, personnel, and scope of services. Managed initial call intake for the department, routed calls and messages appropriately and efficiently. Distributed information related to departmental activities, policies, and other material to other. Conducted the basic level assessment of customer service needs and makes arrangements to ensure. Headline : Senior Customer Service Support looking to obtain a position as an administrative assistant position. 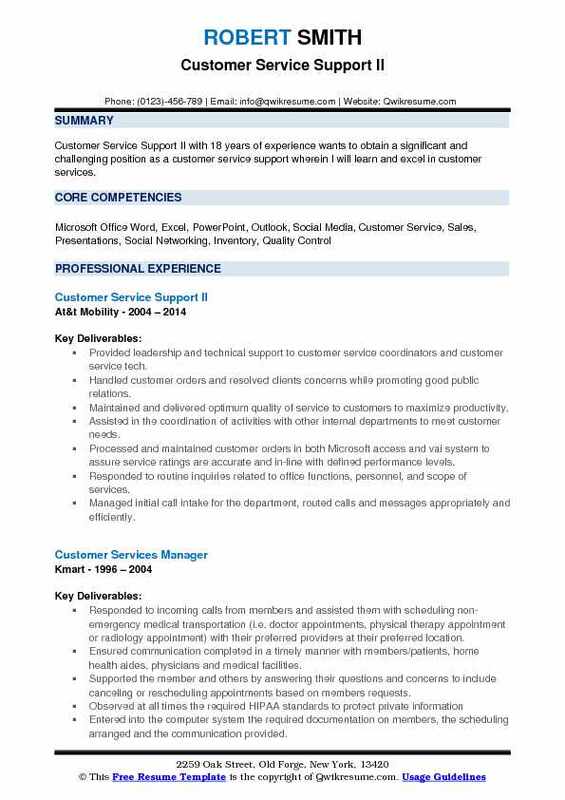 I have over 6 years as experience with customer service and working with the sales team. I can adapt to the fast-paced environment. Provided customer service support to the top sales accounts for a lace firm that is an innovative and reliable supplier to both the lingerie, dress and bridal trades. Developed strong relationships with over 100 clienteles (both designers and buyers) within the U.S and Central America by providing recommendations for their designing needs. Worked closely with the sales team to confirm product pricing, provide insight into commission adjustments, and coordinate with sample distribution. Worked jointly with the production team to source fabrics, obtain order minimums and work with the color department on color approval and lab dip requests. Reviewed and confirmed all purchase orders submitted by various customers to ensure accuracy before processing the order to data entry department. Assisted with inventory management for two warehouses by providing an allocation to finished goods, low list, and stock book maintenance. Solely responsible for reviewing and providing status on open order reports, approving shipping documents, and closing orders upon delivery. Summary : Sr. Customer Service Support with 10 years of experience. Excellent leadership, customer service, communication, and presentation skills. Ability to interface effectively with all levels of employees and management. Aptitude to work and be a self-starter in an unstructured environment. Proven experience in working in cross-functional situations. Proficient in Microsoft Office, ADP payroll system, Typing Speed-45 wpm. Produced/formatted the correspondence for the follow-through of complaints received. Assisted with the maintenance of departmental performance improvement documentation. Participated on departmental and/or interdepartmental performance improvement teams. Made corrections to customers accounts and provided documentation when requested. Verified and performed various maintenance requests to ensure systems and customer information were accurate. Provided assistance to the Manager and other areas of the bank, as needed or requested. Performed daily, weekly, and monthly reporting to include but not limited to: assignments, allocations, work orders and releases. Responded to customer service inquiries concerning account activities, priorities, and status. 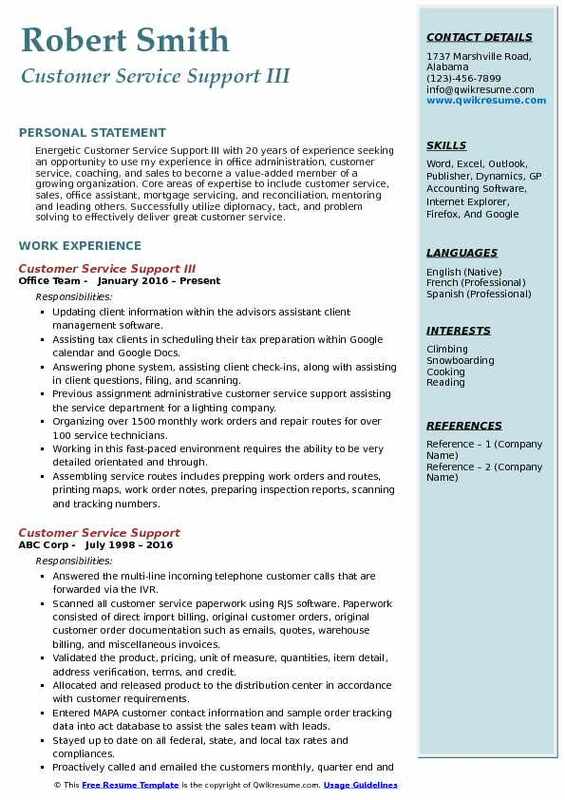 Summary : Energetic Customer Service Support III with 20 years of experience seeking an opportunity to use my experience in office administration, customer service, coaching, and sales to become a value-added member of a growing organization. Core areas of expertise to include customer service, sales, office assistant, mortgage servicing, and reconciliation, mentoring and leading others. Successfully utilize diplomacy, tact, and problem solving to effectively deliver great customer service. Updating client information within the advisors assistant client management software. Assisting tax clients in scheduling their tax preparation within Google calendar and Google Docs. Answering phone system, assisting client check-ins, along with assisting in client questions, filing, and scanning. 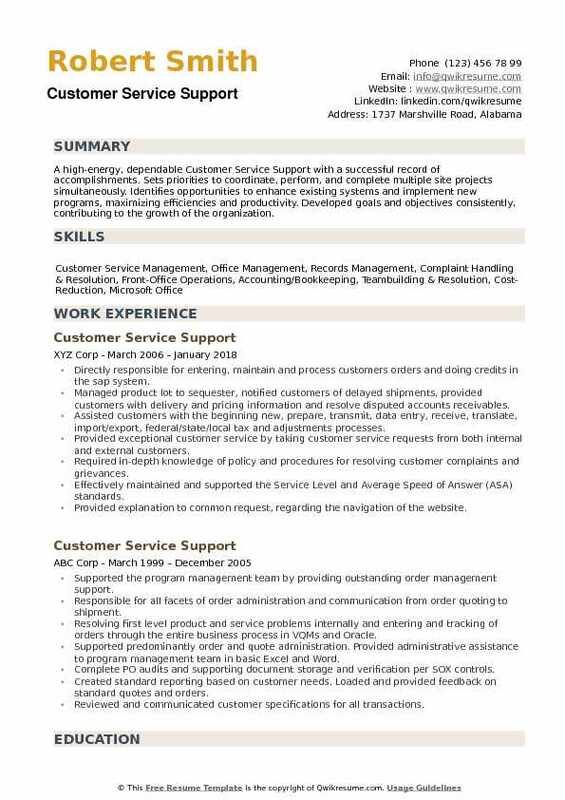 Previous assignment administrative customer service support assisting the service department for a lighting company. Organizing over 1500 monthly work orders and repair routes for over 100 service technicians. Working in this fast-paced environment requires the ability to be very detailed orientated and through. Assembling service routes includes prepping work orders and routes, printing maps, work order notes, preparing inspection reports, scanning and tracking numbers. Maintaining and reconciling a variety of customer billing records as indicated via a customer watch system. Arranging for correction, and forwarding information to the appropriate unit. Summary : Sr. Customer Service Support with 9 years of experience. My main objective is to be able to utilize my creative, analytical skills either through selling a product or in design and gain experience as well. Supporting the business objectives to achieve key performance targets, revenue, att (actual time to repair), etc. Determining and communicating the priorities as provided by the assigned customer to the repair team. Communicating with other Invivo departments as necessary to support overall business function. Participating in the service meetings to provide current and updated information to the assigned customer. Communicating with SPS buyer/planner with shipping and delivery information. Coordinating with other Invivo departments to provide continuous customer service and support. Working with other team members to ensure coils are shipped in a timely manner. Maintaining the databases, mailing lists, telephone networks, and other information. 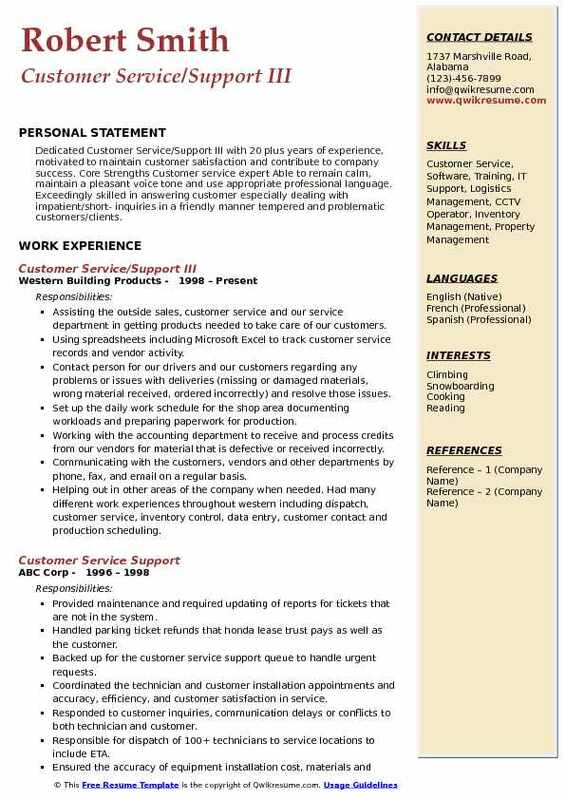 Summary : An experienced Customer Service Support Representative with nationally recognized time management and organizational skills. Good at multi-tasking with multiple projects and problem resolution. An extremely dependable self-starter with 14 years of customer related work Experience. A team player with excellent interpersonal skills who communicates well with customers and all levels of management. Adept in promoting innovative thinking and ability to learn new skills. Provided excellent customer service and administrative support for the activities leading up to the annual Eduserc, Inc. Convention. Made follow-up phone calls to companies and schools to assist with increasing their awareness of and registration for the convention. Conducted research on the internet to identify potential companies to market to locally for the convention. Listening, learning, making phone calls, increasing activities, paying attention to details, using the computer and receiving instructions and even corrections. Provided customer with current order status and advice management of any foreseeable problems in a timely manner. Additionally ensured endorsement requests, other endorsement requests such as name changes, and also handling a heavy amount of email and mail and always giving good customer service. Facility with customers to ensure effective communication/feedback on issues involving customer orders. Summary : Customer Service Support I with 11 years of experience. 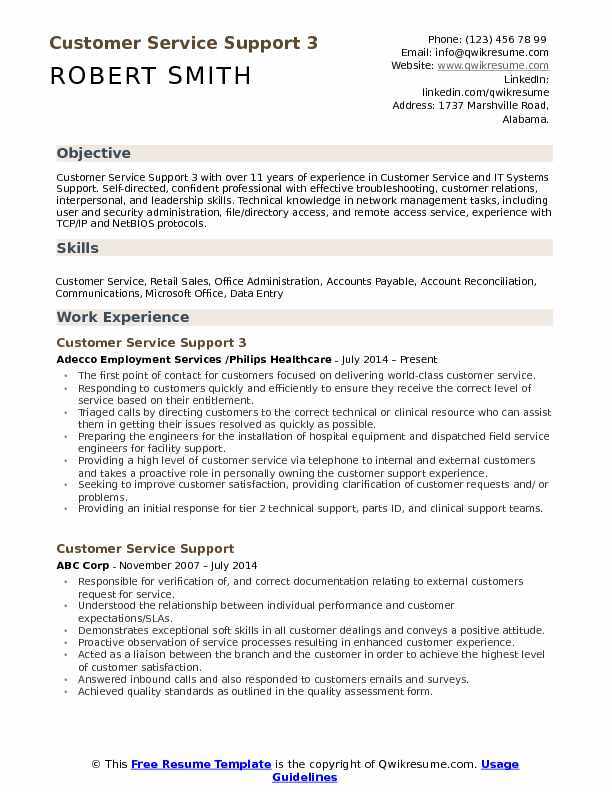 Customer service background with financial data analysis, data entry, billing, administrative experience. Able to quickly learn new tasks, multi-task, work in high pressure/fast-paced environment, independently and in teams. Daily and monthly invoicing, verifying the accuracy of charges, credit card transactions, ACHs, CODs, transferring orders to invoices, and posting. Controlling the customers' accounts in regards to denying or approving orders. Providing customer service back-up in an inbound call center to ensure customers are handled quickly and efficiently. Approving all requests for credits submitted by employees before presenting to accounting. Training the merchants on deploying, set-up, and operation of new pos equipment. Navigating the customers through the company website and maintaining their accounts by doing updates and password resets as requested. Selling additional services by recognizing opportunities to up-sell accounts, explaining new features. Resolving the problems by clarifying issues, researching and exploring the answers and alternative solutions and implementing the solutions. Summary : Dedicated Customer Service/Support III with 20 plus years of experience, motivated to maintain customer satisfaction and contribute to company success. Core Strengths Customer service expert Able to remain calm, maintain a pleasant voice tone and use appropriate professional language. Exceedingly skilled in answering customer especially dealing with impatient/short- inquiries in a friendly manner tempered and problematic customers/clients. Assisting the outside sales, customer service and our service department in getting products needed to take care of our customers. Using spreadsheets including Microsoft Excel to track customer service records and vendor activity. Contact person for our drivers and our customers regarding any problems or issues with deliveries (missing or damaged materials, wrong material received, ordered incorrectly) and resolve those issues. Set up the daily work schedule for the shop area documenting workloads and preparing paperwork for production. Working with the accounting department to receive and process credits from our vendors for material that is defective or received incorrectly. Communicating with the customers, vendors and other departments by phone, fax, and email on a regular basis. Helping out in other areas of the company when needed. Had many different work experiences throughout western including dispatch, customer service, inventory control, data entry, customer contact and production scheduling. 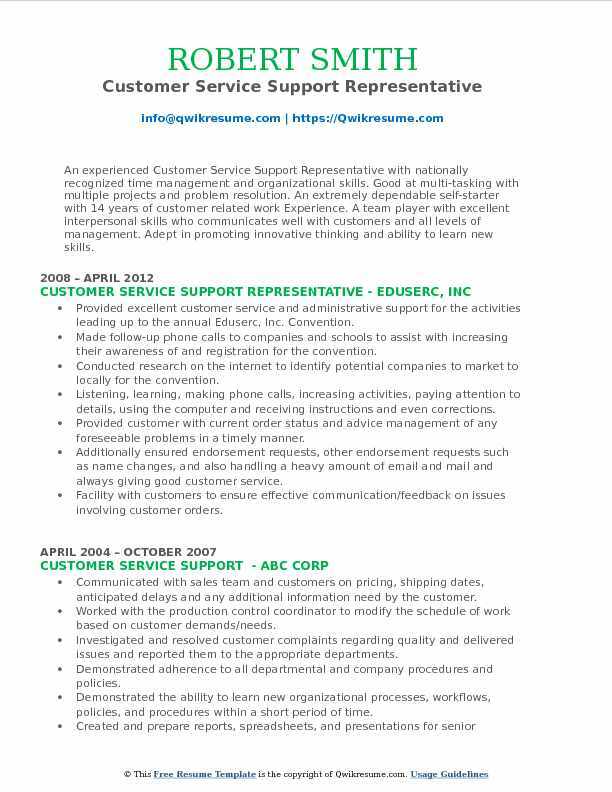 Summary : A high-energy, dependable Customer Service Support with a successful record of accomplishments. Sets priorities to coordinate, perform, and complete multiple site projects simultaneously. Identifies opportunities to enhance existing systems and implement new programs, maximizing efficiencies and productivity. Developed goals and objectives consistently, contributing to the growth of the organization. Directly responsible for entering, maintain and process customers orders and doing credits in the sap system. Managed product lot to sequester, notified customers of delayed shipments, provided customers with delivery and pricing information and resolve disputed accounts receivables. Assisted customers with the beginning new, prepare, transmit, data entry, receive, translate, import/export, federal/state/local tax and adjustments processes. Provided exceptional customer service by taking customer service requests from both internal and external customers. Required in-depth knowledge of policy and procedures for resolving customer complaints and grievances. Effectively maintained and supported the Service Level and Average Speed of Answer (ASA) standards. Provided explanation to common request, regarding the navigation of the website. Retrieved and created the electronic mail to customers and stores regarding order status and product inquiries. Responded to product inquiries and explore all avenues of assistance available to the customer to adhere to department quotas.